Good morning. 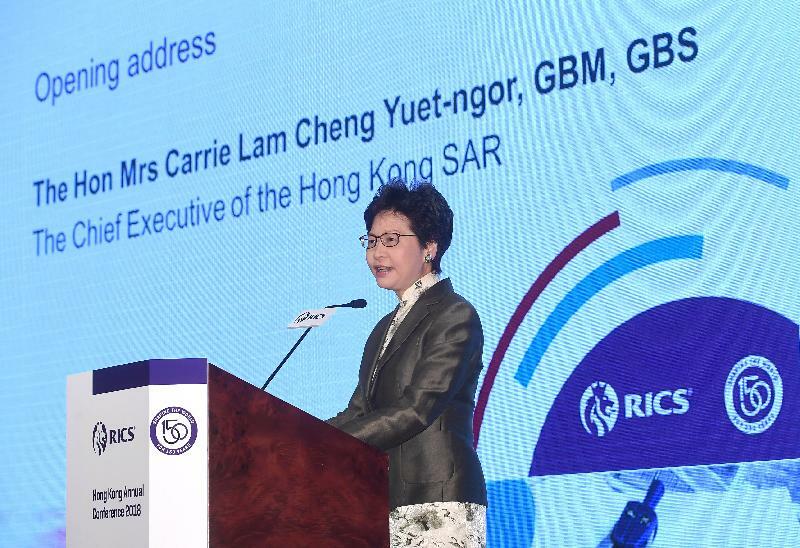 It gives me great pleasure to be here today for the Royal Institution of Chartered Surveyors Hong Kong Annual Conference. This is a welcome opportunity to speak to the surveyors of Hong Kong, professionals who make a difference, day after day, year after year. Before I continue, let me just send my deepest congratulations to Chris, who is now the President-elect of RICS, a very distinguished position. Chris, you have made us proud. This pride is not confined to your dad and mum, Nick and Maggie, who have been my good friends and my partners in harbourfront enhancement over the years. You really have made us proud, so I look forward to attending your inauguration reception later this year. Surveyors are professionals who know much more than the price of property. They know the value of land and the future it helps build for business and our community. They know as well the vital importance of the built environment, of delivering enduring social value as well as economic dividends. I have been fortunate to know a good many of you over the years, particularly in my time as Secretary for Development. I had the honour to work with you in creating a better built environment for Hong Kong through many initiatives, from sustainable development and urban regeneration to the revitalisation of industrial buildings and Operation Building Bright. And I am proud to be recognised by RICS - during my visit to London in 2012, I had the pleasure of attending a luncheon hosted by RICS, during which I was presented Honorary Membership of the Institution. So I am one of you. Among the many things that I did together with surveyors when I was Secretary for Development, one has always been close to my heart, and that is Energizing Kowloon East to create a second CBD in Hong Kong. I am pleased to note the remarkable progress made since announcement in late 2011, especially in rejuvenating the older parts of Kwun Tong. It is gratifying to read from time to time in reports by surveying firms about their recognition of this major initiative. Your profession is about building a better future for all of us. In this regard, the theme of today's conference is most timely: "Establishing Hong Kong as the nucleus of a thriving Greater Bay Area". The Bay Area development is now being taken forward as a national strategy and the detailed Development Plan will be promulgated shortly. What is meant by being the "nucleus" is of course subject to interpretation. If it means that Hong Kong is to participate fully and actively in the Bay Area development, I must say that I could not agree more. Indeed it is exactly what my Government is going to do. However, it is important to recognise the key and the driving force for a successful Bay Area. It is important to recognise that each of the nine cities and the two Special Administrative Regions in the Bay Area is clearly blessed with its own strengths, its own unique advantages. Combined, those advantages can only complement one another, and can only create a whole whose strengths are markedly greater than its parts. So the Bay Area development does not focus on Hong Kong or any other city as the nucleus. Instead, it is about the cities complementing each other to maximise the results. On this, Premier Li Keqiang made it clear when he addressed a press conference in March, that Guangdong, Hong Kong and Macao must draw upon each other's comparative strengths; must work together if we are to build a world-class Bay Area for the 21st century. Following their visit last month to the Bay Area, our Legislative Council (LegCo) Members, and the Hon Mrs Regina Ip is with us this morning, have a much better appreciation of the value of mutually beneficial co-operation. A delegation of more than 30 LegCo Members led by the Hon Jeffrey Lam, Chairman of the Panel on Economic Development, spent three days in five Bay Area cities in late April. They called it a "pragmatic and constructive" visit. 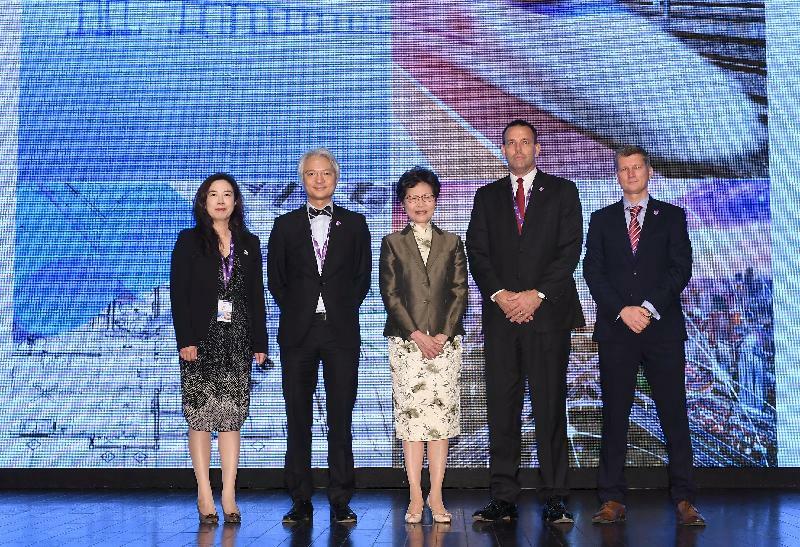 Many legislators, including some pan-democrats, went further, arguing that Hong Kong had to grasp the boundless promise of the Bay Area or risk falling behind our sister cities. I have spent some good time in the Bay Area cities this year. Indeed, I was in Huizhou just two days ago; in Guangzhou yesterday. I also spent two days in the Bay Area at the end of March. Visiting Shenzhen, Zhongshan and Zhuhai, I saw, first-hand, the long-term potential for Hong Kong in the Bay Area. Take education as an example. My Government places considerable emphasis on developing Hong Kong into a regional centre for education. In Shenzhen, I participated in the establishment ceremony of Harmonia College, which is part of the Chinese University of Hong Kong, Shenzhen. Opened four years ago, Chinese University's Shenzhen campus is attracting international talent and has already established several innovative research institutes. And that, ladies and gentlemen, is just the beginning. I do encourage our world-class universities, five of them are in the world's top 100, to continue their efforts in establishing their presence in the Bay Area. The same goes for other industries in which we have an edge, such as medical services. Shenzhen is a centre for advanced manufacturing and innovation and technology. We are investing greatly in innovation and technology, too, and there will be much opportunity for technology collaboration between Hong Kong and Shenzhen as the Bay Area evolves. We are, as you know, already partners in the 87-hectare Hong Kong-Shenzhen Innovation and Technology Park. Four times the size of Hong Kong Science Park, it is expected to inject more than US$7 billion a year into Hong Kong's economy once it is up and running. We have already completed the statutory planning process, and we are working hard towards the target of providing the first developable land for the Park by 2021. The Innovation and Technology Park will play a critical role in the Guangdong-Hong Kong-Macao Bay Area's rise as Asia's Silicon Valley. That, ladies and gentlemen, is at the heart of the Bay Area's promise - the mutually agreeable and mutually rewarding co-operation emphasised by Premier Li Keqiang. It is also the type of co-operation that takes compelling advantage of our respective strengths. Earlier this week, such co-operation has taken a major boost with the extension of the central fiscal science and technology plans to universities and research institutions in Hong Kong, and the funds could now be deployed here in Hong Kong. Some may question the Bay Area - or at least Hong Kong's role in it. They argue that with Guangdong's major cities advancing at enormous speed, and the economic differentials between us ever diminishing, it may not be good news for Hong Kong in the long run. I think such worries are misplaced. Hong Kong's strengths are rooted in our "One Country, Two Systems" advantage. This advantage will not disappear or diminish. The freest economy in the world, Hong Kong delivers high-powered financial and professional services and global connections, even as we deepen our economic ties to the Mainland. In this regard, the legislators who visited the Bay Area last month - particularly those who are not pro-establishment - returned home impressed by the frequency with which Mainland officials spoke of Hong Kong's acknowledged advantages: the rule of law, our financial prowess and our buoyant internationalism. They might well have added the singular professionalism of our surveying sector. Through CEPA, our exclusive free-trade pact with the Mainland, we enjoy privileged access to the world's second-largest market. And our strategic position is notably included in the 13th Five-Year Plan, as well as the plans for the Guangdong Free Trade Zone, including the strategic areas of Qianhai, Hengqin and Nansha. That said, we must recognise the clear socio-economic differences between the Mainland and Hong Kong. Those differences have, to a considerable extent, blunted investment and trading between us over the years. Travelling time and separation from families have also slowed the flow of Hong Kong people wanting to work in the Mainland. The gap in wages and living standards between Hong Kong and the Mainland is another high hurdle we will need to tackle. As for investors, familiarity with the market, local connections, financial gearing, risks and returns are their prime considerations and concerns. So it should not surprise that those gaining ground in the Mainland market have principally been consultants and project managers - professionals who offer knowledge-based services in which resource input and business risk are relatively low. As for those sectors calling for substantial capital investment, and the risks that come with it - I am thinking here of our developers and contractors - they have been clearly less enthusiastic about setting up across the boundary. I am confident that the Bay Area development will be able to change all that. As a start, consider its size: total area, 56 000 square kilometres; combined population, 68 million; collective GDP, US$1.5 trillion. In terms of GDP, the Bay Area itself is comparable to Australia and Korea. Beyond the notable numbers, the cities of the Bay Area form China's most international, open and economically vibrant region. Working together, they will play a big role in the socio-economic development, reform and opening up of the country. It helps, too, that the flow of business and people within the Bay Area will soon be greatly enhanced, thanks to the opening, later this year, of the Hong Kong-Zhuhai-Macao Bridge, the Hong Kong section of the Guangzhou-Shenzhen-Hong Kong Express Rail Link, and the Liantang-Heung Yuen Wai new border point, which, let me add, will be our first land-based control point with direct access facilities for both vehicles and passengers. These infrastructure projects are state-of-the-art advances. They will bring the connected cities within the critical one-hour living circle. Looking a bit further ahead, there is the Shenzhen-Zhongshan Link, which I inspected during my March visit. Now under construction, it will greatly shorten travelling time from Hong Kong to the west bank of the Pearl River via Shenzhen upon completion, expected in 2024. I was pleased to visit the Hong Kong-Zhuhai-Macao Bridge earlier this year. Actually I have visited it twice, one starting from the Hong Kong side and another one from the Zhuhai side. In both visits I went all the way to the border between Guangdong and Hong Kong. In other words, I have already travelled across the whole bridge. It is a truly spectacular and amazing project. At 55 kilometres, it is the longest sea-crossing bridge in the world. And it will boost the flow of goods, people and opportunity throughout the Bay Area. Apart from infrastructure projects, when President Xi Jinping delivered his important speech in Hong Kong on 1st July last year, he mentioned that the relevant Central Government departments would actively consider adopting concrete measures to make it more convenient for the people of Hong Kong to study, work and live in the Mainland, and provide more opportunities for them to pursue career development on the vast Mainland. Since then, Central Government departments have already promulgated two batches of facilitation measures for Hong Kong people, covering the areas of education, employment, buying train tickets, etc. We expect more to come, especially in the context of the Bay Area development, further boosting the flow of people. Being a services economy, I believe that our services will surely be in ever greater demand as the Bay Area cities grow and prosper. Indeed, each of the Bay Area's cities will focus on its respective strengths, whether in commerce, trading, innovation and technology, R&D, bio-medicine, the environment or any other industry or business. And they will be supported by such sectors as construction, leisure, entertainment and luxury goods. In any case, a prosperous Bay Area will generate increasing demand for infrastructure construction and high-end, high value-added services. That is pitching to our strength and our expertise. It will be an opportunity Hong Kong will smartly and eagerly run with. And what about the profession of surveying? To start with, surveyors have long been at the forefront when it comes to building contacts and business opportunities with the Mainland. Indeed, I am amazed at your foresight. It goes all the way back to the late 1980s. That is when you began to introduce estate planning, valuation, quantity surveying and contract management services to the Mainland - on your own and through joint ventures with overseas consultants. And when the Mainland introduced its opening-up policy - 40 years ago this year - you were instrumental in introducing the Hong Kong system to the Mainland's businesses. As Secretary for Development, I helped lead discussions with Mainland authorities on market access and the reciprocal recognition of professional qualifications. Through CEPA and pilot trials in Guangdong, we enjoyed some successes. Further opening up measures came through trade in services and the economic and technical agreement under CEPA and the Guangdong Free Trade Zone. Benefiting from these market access arrangements, Hong Kong professionals have long played a substantive role in Mainland projects. Today, Hong Kong standards and codes of practice have been, or will soon be, adopted on two projects in Qianhai, as well as foreign-aid projects in Cambodia and Nepal. The results, I am pleased to note, are encouraging, with Hong Kong's procurement and project management approach finding widespread favour. The greater significance of Hong Kong's participation in Mainland projects is in showcasing our world-class talent and expertise. As the Bay Area becomes a reality, accelerating the flow of people, goods, capital and information among the cities, the boundaries of industries and areas of specialisation will become increasingly redefined. As collaboration becomes the norm, the market will open up to small and medium enterprises and to start-ups. In construction, I am confident Hong Kong can make a difference through such high-tech, value-added services as building information modelling, virtual reality, e-procurement, DIY design, modular integrated construction and even robotics. No doubt, we will also see work carried out off-site, with fabrication yards set up across the boundary. And that can only boost our production efficiency and economy. So, ladies and gentlemen, to sum up what I said, Hong Kong will actively participate in taking forward the development of the Bay Area. Hong Kong will continue to play our role as an international finance and trade hub. We will continue to provide high value-added finance, logistics and professional services. We will continue to enable innovation and technology. We will continue to serve as an international arbitration centre powered by the rule of law. Together with other Bay Area cities, we will apply our strengths and experience to sustain and expand the country's remarkable development. For you, as for Hong Kong, the opportunities will be there, and they will be abundant, ladies and gentlemen. I look forward to the contribution from our surveyors to the development of a world-class Bay Area for the 21st century. On this note, I wish you all a very rewarding conference and a thriving future in the Bay Area.